While we use modern floss shown here, the concept of floss is actually prehistoric! 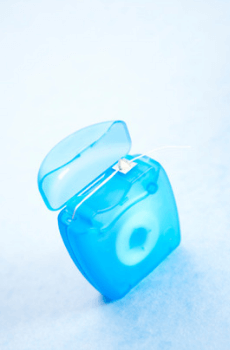 Flossing has long been considered an important ritual to maintain optimum oral hygiene. However, experts observe that only about 30 percent of us floss on a daily basis. Those who don’t floss conveniently point to studies that show little scientific evidence that flossing makes a difference. Yet, common sense suggests that disturbing the bacteria and plaque between our teeth by flossing is beneficial. With or without scientific studies. Since few of us seem to want to conduct this simple procedure, how did we start doing it in the first place? Flossing isn’t a new idea. It surprises many to learn that researchers have learned that cleaning between the teeth is, well, prehistoric. Naturally, the earliest versions of floss were quite different from the high tech floss we use. Grooves from floss and toothpicks have been found in the mouths of prehistoric humans. Many believe that horsehair was used as floss. Twigs were employed as toothpicks to dislodge food trapped between the teeth. It was 200 years ago that New Orleans dentist Dr. Levi Spear Parmly began advising his patients to use thin silk thread to clean between their teeth. The idea caught on. By 1898 a patent for dental floss was filed for the same silk material used by doctors for silk stitches. By the 1940s, nylon replaced silk. Its consistent texture and resistance to shredding was a huge improvement over silk. It also permitted the development of a waxed floss. More recently dental floss has evolved into flavored tapes, a soft, yarn-like material and even Gore-Tex. Does flossing help? We think so. After looking into the mouths of hundreds of our patients, we can tell the 30-percenters from the non-flossers. The differences can be striking. And here’s an important tip. Many people floss incorrectly, moving it in and out with a sawing motion. Far better is an up and down motion along the inside surfaces of each tooth. Even better? Listen for a “squeaking” sound that indicates a clean, smooth surface. Don’t hear the sound of squeaky-clean? It may be time for a professional cleaning!